We’ve just released a new patch for Heroes of the Storm! Today’s update marks the beginning of our Lunar Festival 2016 event, which brings new special event quests, rewards, and more to the game! Check out the patch notes below. We’re ringing in the new year with a brand new Lunar Festival event, which includes new and returning skins and bundles, as well as new Special Event quests and rewards! Be sure to complete your quests and pick up a few skins before our 2016 Lunar Festival event concludes on Tuesday, March 1. Complete 25 games in Versus A.I., Quick Match, or Ranked play during the Lunar Festival 2016 event to earn a special Monkey Elder holiday portrait! Each day during this year’s Lunar Festival event, you’ll receive a Special Event quest to catch the Monkey Elder. Work together to follow and catch the Monkey Elder who will drop a Red Envelope that awards 100 gold to each ally with an active Monkey Elder Special Event quest. Hero Replay Protocol is now open source and available for use by players who wish to write or upgrade their own community-driven replay analysis tools. Click here to learn more about Hero Replay Protocol, or follow this link to access our heroprotocol directly on GitHub. 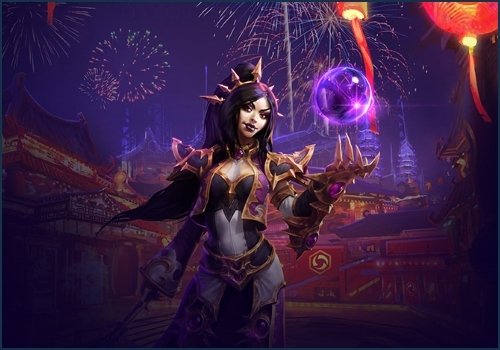 Li-Ming, Rebellious Wizard, has been added to Heroes of the Storm and is now available for play! Read on for a brief overview of her Abilities. Participating in a Takedown refreshes all of your Ability cooldowns. Fire three missiles toward a location, each damaging the first enemy it hits. Instantly teleport a short distance. Channel a powerful beam of energy, dealing heavy damage over 2.5 seconds to all enemies in its path. The direction of the beam follows your cursor. Damage and knock all enemies away from the targeted area. Bell Towers on Towers of Doom have received updated art to better represent the area of terrain blocked by the base of the Structure. Cores are now each surrounded by a set of floating shields to better indicate when they are invulnerable. The icons for many Talents that exist on the same Talent tier, and modify the same Ability, have received new color tints to help players more easily tell them apart at a glance. The Imposing Presence Talent’s broken sword visual effect will now appear whenever the player is affected by any Attack Speed slow. Several Talents that modify Heroes’ Basic Attacks have received updated button art. All Arthas Skins and Skin Variations have received facial animations. New Bundles have been added for a limited time! New Mounts have been added for a limited time. Johanna’s prices have been reduced to $6.49 USD and 4,000 Gold. Level-up sounds, and enemy death sound effects have been updated to improve clarity. Towers of Doom has received updated music. Murky and Leoric have received unique death sound effects. The lobby host may now choose Heroes for each A.I. player in Custom Game Lobbies using the new Pick Hero dropdown on the right side of each A.I. player slot. Killstreak Flames have been removed to improve clarity during gameplay. Battleground objective UI for Blackheart’s Bay and Tomb of the Spider Queen will now indicate the total number of Doubloons and Gems each team currently has in its possession. Health bars above Cores will now clearly indicate when that Core is invulnerable. Floating combat text has been visually reworked so that damage, healing, and other important numbers are easier to differentiate during battle. Floating combat text numbers now fire away from the target in staggered directions, rather than stacking on top of one another. Critical strikes have received updated art to make them more visually apparent. The new Replay and Observer Interface that was recently made available for testing has received additional improvements, and will now function as the default interface for all players while viewing Replays or observing live games. Now that the new Observer Interface is enabled by default, the standalone version that was previously available for download is no longer supported. Continuing to use the old standalone version of the interface may result in display issues. This can be resolved by heading to the Observer and Replay Options menu, and then selecting “Default” from the Observer Interface dropdown. Read our recent blog post to learn more about the new interface. Reduced the frequency at which players can issue pings before they become unable to issue additional pings for a period of time. The duration that ping-spamming players will be prevented from issuing additional pings has been increased. Abilities or Talents that apply Invulnerability or Stasis will now also display a timer to indicate the duration of these effects. Cores will now display an “Invulnerable” message if attacked by an enemy when no allied Keeps have been destroyed. Developer Comments: The scaling changes we released in December made it so Heroes could dive into Structures with impunity during the early game. Increasing the damage that Structures deal to Heroes allows defending players to feel a bit safer. We are exploring other fixes to help Structures feel more meaningful throughout the game and will release them when they are ready. Developer Comments: Since the Dragon Knight is flagged as a Hero, the increased structure damage was doing too much damage; Increasing Rubble Maker’s effectiveness to compensate felt appropriate. Savage Charge felt like a dead button a lot of the time due to the Ability’s long channel time. This change has made the button feel a lot better to press. Developer Comments: The Arcane Punishers have shown to be more effective than their Frozen and Mortar counterparts, so we lowered their Arcane Sentry damage to bring them more in line with other Punisher types. Ownership of nearby Bell Towers will no longer determine which lane Sapper Mercenaries will travel down. The two southern Sapper camps will now always travel down the bottom lane. Text has been added to the Tunnels to help clarify their one-way use. A new Healing Dummy has been added above the existing Target Dummy, that calculates healing and healing over time. Developer Comments: A few months of data have given us a good idea about which of Gall’s talents are under and over performing. We have made some balance changes and talent swaps to help these issues. Ranged Basic Attack animation speed increased by 50%. She can be very frustrating to play against for newer players. She isn’t viable in competitive play. Her Talent pick rates were not great. This new direction for Nova addresses the first two issues by lowering her overall burst potential, while increasing her damage output overall. The most noticeable way we did this was through lowering both her Snipe cooldown and damage. For the third concern, we decided to do an overarching sweep of her Talents, removing the ones that weren’t working, and created some new ones that should offer interesting choices that promote Nova’s roaming and ganking nature. We realize that this is a slight departure from her long history of burst damage, but feel it is a better direction for her in the long run. We are watching her very carefully in order to react quickly and tune accordingly. Developer Comments: We really like what Lamb to the Slaughter brings to The Butcher’s kit, but felt there were too many hard counters to it. These changes should help make The Butcher’s target feel more like they should when bound to a stake: scared and helpless. Developer Comments: Being able to cast Shadow Assault more frequently and stick to his target better should help make Zeratul a lot more lethal when he chooses to give up the massive amount of utility that Void Prison brings. Developer Comments: We really like that Malfurion can act as a partial Mana-battery to teammates and that he has great synergy with heavy Mana-users. We wanted to play this up while also making Versatile a more attractive Talent pick. Rehgar was usually brought to teams as a main support, which meant players were heavily incentivized to pick every healing option available to him. We tried to rectify this by placing healing Talents against each other on the same Talent tier. Of course, this removes some of his healing power as players cannot stack each Talent, so we also increased his base power to compensate. Our hope is that these changes will allow Rehgar players to be a more aggressive while supporting their team, which was always his design intent. Developer Comments: Similar to Gall, a few months of data have given us a good idea about which of Cho’s Talents are under and over performing. We have made some balance changes and Talent swaps to help these issues. Developer Comments: Overall, we are really happy with Sonya, but her burst potential was a bit higher than we were comfortable with. Resolved an issue that could cause players using Windows 10 machines to experience high CPU and disk usage when launching the Heroes client. AI-piloted Dragon Knights and Garden Terrors can now properly follow the player when pinged. Sounds will no longer continue to play on Mac machines while the Heroes client is in the background if the Play in Background setting is disabled. Mouse clicks should now more accurately reflect the target model’s shape on Low graphic settings. Corrected several typos and tooltip errors across several aspects of the game. The sand-themed visual effects for Bikini Stitches’s Devour are no longer being used by other Stitches skin variations. The tree ornament visual effects for Greatfather Winter Stitches’ Putrid Bile are no longer being used by other Stitches skin variations. Missiles will now travel at one consistent speed on Towers of Doom. AI players on Towers of Doom will no longer path through the opposing team’s invulnerable defenses when traveling from the enemy’s side of the Battleground to an active Altar. Diagonally placed shrubs will now properly hide Heroes within them. Pinging the Tunnel Entrance on Towers of Doom in a French game client will now display the proper message in French. Players punted out of an enemy Hall of Storms will no longer be persistently stunned if an enemy unit blocked the path of the punt. The Toggle Cooldowns button in Try Mode will now properly reset the cooldowns for Azmodan’s Sin’s Grasp and Uther’s Benediction Talents. Silences will no longer prevent Heroes from entering a Dragon Knight or Garden Terror. Fixed an issue that prevented Chen from traveling through the intended target using Flying Kick. Chen’s Abilities will no longer grant him 3 extra Brew when using an Ability while channeling Fortifying Brew. Fixed a bug that could prevent Gall from receiving the Will of Gall activated Talent if Cho selected the Talent while channeling to enter Lt. Morales’ Medivac. The activation timer for Gall’s Runic Blast now increases appropriately after taking the Bomb’s Away Talent. Jaina’s Ring of Frost now properly affects enemies that overlap the inner-edge of the Ability’s targeting ring. Muradin’s Dwarf Toss will no longer cause him to become stuck inside of Gates. Murky’s Egg will no longer briefly display on the minimap if he is killed by Nova’s Pinning Shot. Nova’s Crippling Shot Talent will no longer allow Holo Decoys’ Pinning Shots to make the target Vulnerable without the Lethal Decoy Talent. Malfurion’s Innervate can no longer be cast on Misha. Fixed an issue that could allow additional Mishas to spawn if Rexxar was killed by immolation damage. Sgt. Hammer’s Siege Mode will no longer visually persist if she is interrupted while casting Siege Mode. Players can no longer accidentally queue Abilities or Activated Talents while Gorged by Stitches. Lethal damage will no longer improperly trigger the cooldown for Tassadar’s Prescience Talent. Tychus can now properly use a Healing Fountain while in Odin form. Tooltips for Zagara’s Hunter Killer now list the proper cooldown duration. Fixed an issue that could cause floating combat text numbers to display if a timed-life unit’s duration expired. The tooltip for Zeratul’s Permanent Cloak Trait now properly indicates that using Abilities will reveal him. The Spider Queen’s voiceover will now play appropriately when triggering objectives on Tomb of the Spider Queen. Fixed an issue that could allow the Team League portrait border and ranking to be displayed during Hero League loading screens, and vice versa. The Friend Bonus icon will no longer appear inactive after adding a new friend while both players were in a party. Skins and Skin Variations in the Most Played this Season section of the Player Profile will no longer disappear after mousing over them.